Being a truck driver has it’s advantages and it’s disadvantages like any other job but sometimes it’s a lot more extreme than other jobs. Part of our job (my husband is now part of the family business and we work together) is to do work for a very large oil drilling company. I’m proud to work for them as I know how finicky they are with everything and the extremes they go to, to protect the environment. I’ve seen the things they’ve done for farmers (they saved a farmers land and livestock from a bush fire which left the rig without fire extinguishes this meant the million dollar a day rig was closed until we delivered them new fire extinguishes). 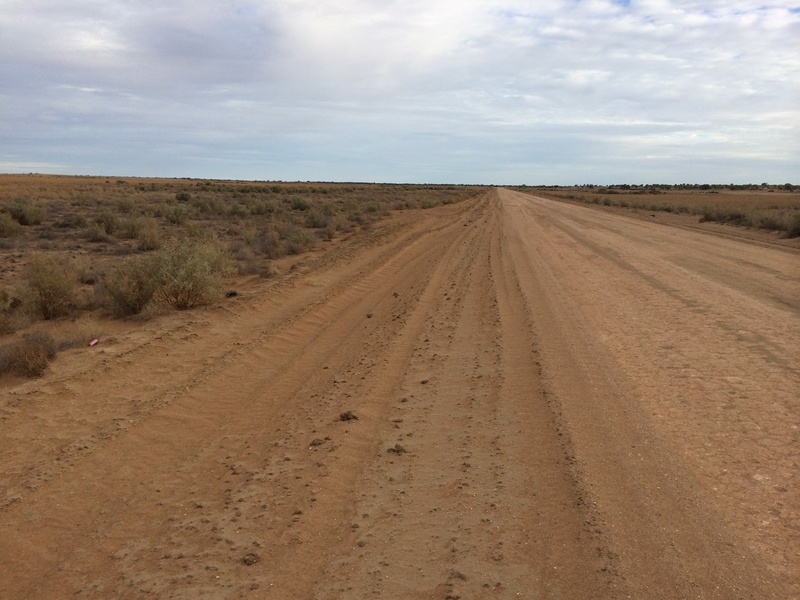 So on Friday afternoon we were called to do a 800km round trip out to the country – no big deal we do that often. We got home late and had to wake early saturday as we’d promised to hang out with good friends. So 5hrs sleep later we were at a motor show when we get a call. We have to leave striaght away and head to South Australia. That’s a 3400km round trip…. Thankfully our friends understood and we went home, packed then went to load and leave. Naturally we had a time limit – had to be there before monday…. nice! It’s pretty good money and money gives both my husband and I the luxury to follow our dreams. That didn’t mean we weren’t dreading it. I’ve done this trip a few times with my dad. The call these jobs “hotshots” and the oil company are very loyal to us because they know we always get things done without problems.On these hotshots you need 2 drivers to ensure you don’t have to stop for a break. We have a smaller truck than a Semi so it doesn’t have a sleeper cab – bugger! With two mattresses squashed behind the seats, 40+litres of water we left. We live in good old Queensland so for most of the trip we were in QLD (thank goodess – the roads are so much better). We are lucky in our job that we get to see Australia but certainly not at a leisurely pace. The poor little truck never stopped in 24hrs! It took us a full day of non-stop driving to finally get there. I was shocked at how much wildlife we saw. Naturally as soon as you travelling in any rural area you’re going to see kangaroos and wallabies. When you’re driving and they’re lining the side of the roads (they like the green grass that grows next to the road) you dread seeing them. Hitting an animal is always terrible but they can do A LOT of damage! My hubby John and I took turns driving whilst the other slept squashed behind the seats. When you’re that tired you don’t care where you sleep – Trust me!!! Then we saw a few wild pigs – never a good thing. These things are disgusting pests that are carnivores and even cannibals! If you hit one of those things could be very bad. A few wild goats and of course sheep later and we were close to the S.A. border. It’s hard to explain what northern S.A. looks like (I added some pics). 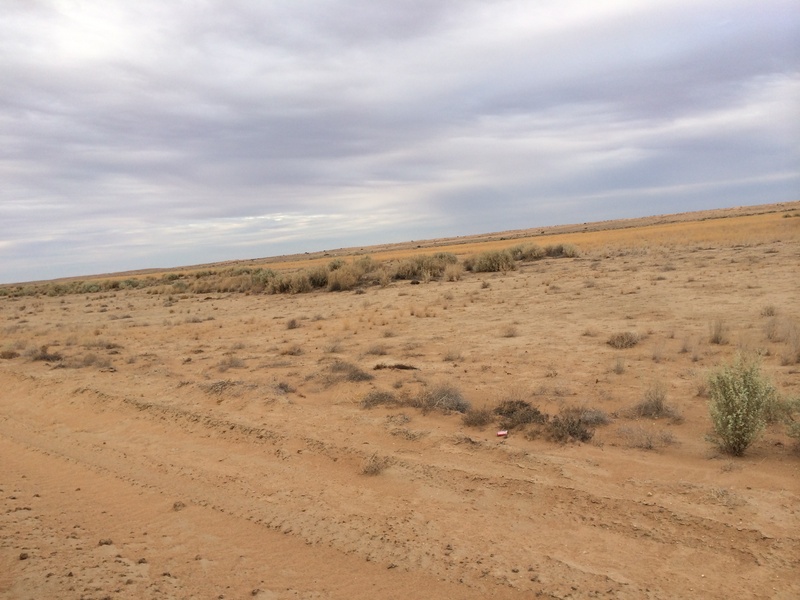 It’s a desert nothingness. Daunting, scary and yet in many ways beautiful. We arrived at the tiny town 250km from the rig at sunrise. This town – Innaminka is like so tiny – there is a shop that is also a pub and a few rooms for accommodation as well as a fuel station (the fuel had dirt and crap all through it!) No phone reception, a hell of a lot of flies – you usually have at least 10 flies sitting on you at any one time no matter what you do. It’s surrounded by a vast desert of absolute nothingness. 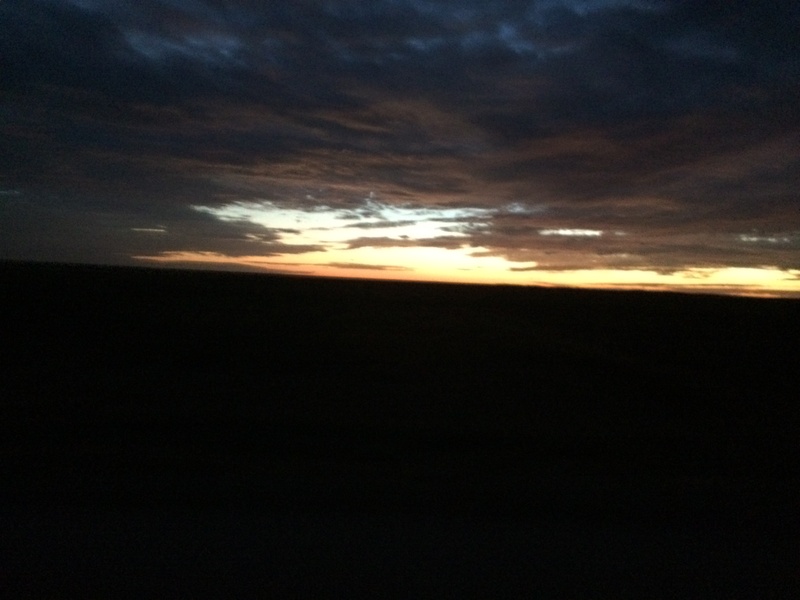 Seeing the sun rise into the darkness shedding light onto the bare plains was really stunning. S.A. only has a few animals that are stupid enough to be able to survive there – Crows, flies and Dingos. The dirt roads are so terrible I got “air time” multiple times while we drove along them. It’s not fun and things break and fall of the poor truck. We got to the rig and then stayed a few hours at the camp. 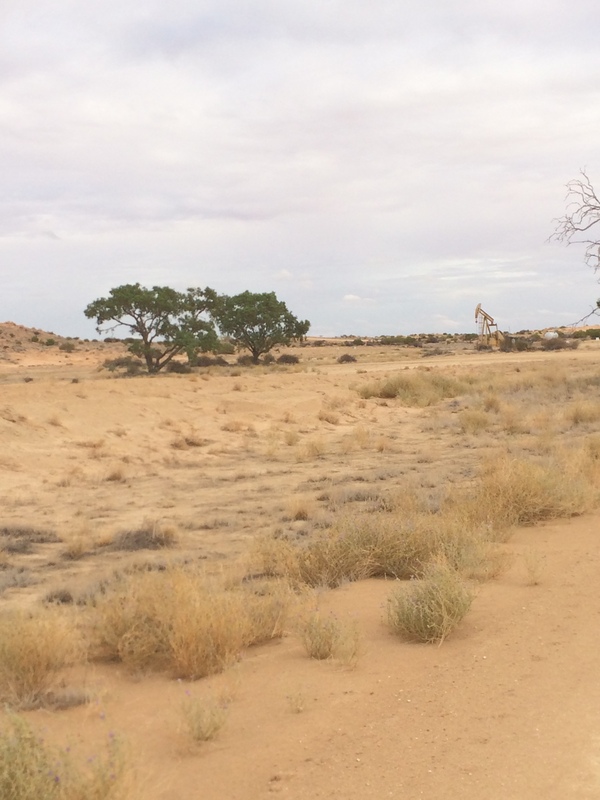 An oil rig camp in the middle of absolutely nowhere is the craziest thing. Shipping containers have been made into soundproof cabins with 2 beds and air con with no light coming in at all. A kitchen, recreation room, internet, a dining room, a chef and a neat ablution building. These containers/buildings are all pushed together making a neat little house area that is up out of the dirt and pretty much luxury. A nice shower was very welcome as was a comfy bed and a professionally cooked meal. They have cleaners and people who do your washing. It’s better than a lot of hotels. All of this can be packed up within a day and moved, never leaving any sign of life in their wake. Crazy stuff. I don’t know how it works especially when they have clean water – in the middle of the dessert. The top of S.A. is oil rig dominated to the point of there being a town Moomba where you need clearance to enter as its all oil rig owned. Its a permanent rig so they have made an oasis in the desert. They have a tennis court, gym, pool, bar and even their own hire car dealership! Mind blowing to the extreme!!! Leaving the luxurious camp only to travel 24hrs of hell to get home was a hard task…. The drive home was also all through the night and I was sad that John wasn’t able to even get a souvenir 😦 The way home was much more eventful and the animals we saw was crazy. Night driving is dangerous especially when you’re driving through unfenced paddocks with black cows randomly appearing. About 10 years ago my dad hit a black horse as he came over a ridge. Thankfully he was ok but the poor horse died. It destroyed the truck though. Dodging cows and horses in the dark is very difficult. At least roos don’t cause as much damage although 6ft roos are pretty scary. As we got closer to home and out of the desert more wildlife came out to play. John desperately wanted to see a wild emu as he had never seen one in the wild (one of our neighbours used to have an emu farm but seeing them wild is much cooler) and much to his delight we saw not just one but atleast 15. A huge snake lay across the road and although I’m sure he was deadly we were in the middle of nowhere so I doubted he would hurt anything important. A huge eagle, wild cat and echidna later and we couldn’t believe the array of wildlife on the sides of the road. When we finally got home we were completely and utterly exhausted. The energy drinks were wearing off and we were feeling the lack of food, sleep and movement (being stuck in a small cab and driving for that long gives you lots of aches and pains).